Mount Pleasant Baptist Church stands strong as a community of believers seeking God’s will. The church is at the heart of a growing community just 40 miles west of Washington, DC. 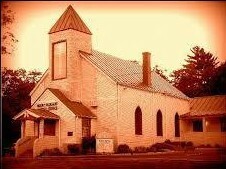 Mount Pleasant Baptist Church of Gainesville, Virginia, was founded in 1877 by a group of Trustees including the Churchville and Brook families, Mrs. Coats, Isaac Jackson, John and Henrietta Perry, and Mrs. Sally Grayson, who hosted the first church meeting in her home. The members constructed the original church building in 1877. In 1882 church members purchased the current property for $10.00, and the church building was disassembled and reassembled at its current location, 15008 Lee Highway in Gainesville. Some years later the building was destroyed in a fire and the members constructed the current building in 1929. Mount Pleasant Baptist Church is a traditional independent Baptist church led by a pastor with assistance of deacons, deaconesses, and trustees. Mount Pleasant Baptist Church is a member of the Northern Virginia Baptist Association . Through its various ministries, Mount Pleasant Baptist Church continues to fulfill God’s promises as it meets the needs of people everywhere in all walks of life. During the early morning hours of August 10, 2012, Mount Pleasant Baptist Church suffered a great loss as our church building caught fire and was deemed uninhabitable for the present time. As many people gathered in dismay and watched as the flames engulfed our building, God sent a message of reassurance. We took comfort in knowing that God will bless us as we move forward in the process of recovery and rebuilding. As many people stopped by during this time we were reminded of just how important this landmark is to the community. We are thankful to all in the community who have expressed concern about our loss and those that have given unselfishly and wholeheartedly. The book of Nehemiah tells a story of Jerusalem being in ruins and its gates destroyed by fire. The story goes on to tell how the surrounding communities of Jerusalem pulled together to take part in the great rebuilding effort of this glorious city. The outpouring of support in this story inspired us to reach out to our surrounding community. Prayerfully, we reach out to you, our local community partner in hopes that you will walk with us on this momentous journey. “No eye has seen, no ears has heard, no mind has conceived what God has prepared for those who love him;” and we invite you to be a partner in our new beginnings. View plans for rebuilding . We invite you to join us anytime on Sunday's at 10:00am for our Worship Service at our temporary location at Northern Virginia Baptist Center, located at 14019 Glenkirk Road, Gainesville, VA 20155. We appreciate any donation to the rebuilding of our church home.